Paris. Plans for a global center to help transfer clean technology to poorer countries have drawn nine bids, including from Indonesia’s National Council on Climate Change, the UN climate forum said on Monday. Parties to the UN Framework Convention on Climate Change (UNFCCC) backed the proposal at a meeting in Durban, South Africa last December. Bidders to host the center include a 13-member consortium led by the Kenya-based UN Environment Programme (UNEP) and whose ranks include energy research institutes in India, the United States and Netherlands, the UNFCCC said in a press release. Others are the Global Environmental Facility (GEF), a Washington-based international funder of environmental programmes; Costa Rica’s Institute of Technology; and Indonesia’s National Council on Climate Change. There is also a bid by the Research Institute of Petrolum Industry (RIPI) in Tehran, which carries out research for Iran’s oil and gas sector. Fossil fuels are the biggest contributor to global warming, which scientists say is inflicting worrying changes to the climate system. The nine applicants will be whittled down to a shortlist of five next month. In May, a UNFCCC expert panel will propose the winner. Final approval rests with the UNFCCC’s annual ministerial-level meeting, taking place in Qatar from November 26-December 7. Jakarta (ANTARA News) – Bank Pembangunan Asia (ADB) menyatakan bahwa biaya adaptasi perubahan iklim yang dibutuhkan bagi negara-negara di kawasan Asia Pasifik dapat mencapai hingga Rp360 triliun (40 miliar dolar Amerika) hingga tahun 2050. Laporan terbaru ADB yang diterima di Jakarta, Rabu, menyebutkan bahwa perubahan iklim diperkirakan akan mengakibatkan terjadinya banyak migrasi pada abad ke-21 ini, sehingga pemerintahan di kawasan Asia-Pasifik yang rentan terkena dampak perubahan iklim mesti mengeluarkan langkah-langkah untuk mengatasi potensi krisis kemanusiaan di masa mendatang tersebut. Laporan ADB bertajuk “Addressing Climate Change and Migration in Asia and the Pacific” itu mencatat bahwa terdapat lebih dari 42 juta orang di kawasan tersebut yang terpaksa berpindah tempat tinggal akibat bencana lingkungan selama dua tahun terakhir. Sejumlah angka dari mereka yang berpindah tempat tinggal tersebut menjadi kaum migran yang tidak dapat pulang kembali ke rumah asalnya atau memilih untuk relokasi atau berpindah ke tempat tinggal baru yang dinilai lebih aman. “Lingkungan menjadi pendorong signifikan dari terjadinya migrasi di Asia-Pasifik seiring dengan bertambahaya jumlah penduduk di area-area yang rentan, seperti zona pantai dataran rendah dan tepi sungai yang terkena erosi atau telah terkikis,” kata Wakil Presiden untuk Manajemen Pengetahuan dan Pembangunan Berkelanjutan ADB, Bindu Lohani. Menurut dia, pemerintahan negara-negara Asia-Pasifik seharusnya tidak menunggu untuk bertindak tetapi segera mengambil langkah sekarang untuk mengurangi kerentanan, memperkuat daya tahan, dan menggunakan migrasi sebagai perangkat adaptasi dibanding membiarkannya sebagai tindakan keputusasaan yang dilakukan warga. Laporan ADB itu juga termasuk yang pertama untuk mengidentifikasi respon kebijakan terkait dampak kejadian lingkungan hidup terhadap migrasi di kawasan Asia-Pasifik. Laporan tersebut menunjukkan bahwa meski kebanyakan migrasi akan berlanjut terjadi di dalam wilayah suatu negara, tetapi terdapat kemungkinan adanya pergerakan lintas negara sehingga berbagai pemerintahan di Asia-Pasifik juga mesti bekerja sama erat terhadap persoalan migrasi tersebut. Selain itu, laporan juga mengidentifikasikan perjanjian, panduan, prinsip, dan forum dialog internasional yang dapat digunakan secara lebih efektif untuk meningkatkan manajemen migrasi. Dalam rangka mengakomodasi dan mengantisipasi peningkatan alur migran di berbagai kota-kota besar, laporan tersebut merekomendasikan investasi yang lebih besar dalam infrastruktur perkotaan dan jasa pelayanan dasar. ADB juga mengidentifikasi perlunya melindungi hak-hak migran dan menyediakan kaum migran dengan akses yang memadai terhadap pendidikan, kesehatan, air, dan sanitasi, serta memperkuat daya tahan komunitas yang terancam perubahan iklim seperti memperbaiki sistem manajemen risiko bencana. vulnerable countries in the world. and the private sector can work together to finance the cost of climate-induced migration. phenomenon at the regional level. rooms, you must register on the ground floor between 8-9 A.M. on 13 March. Victories won by activists around the world tops our list of the big environmental stories of the year. 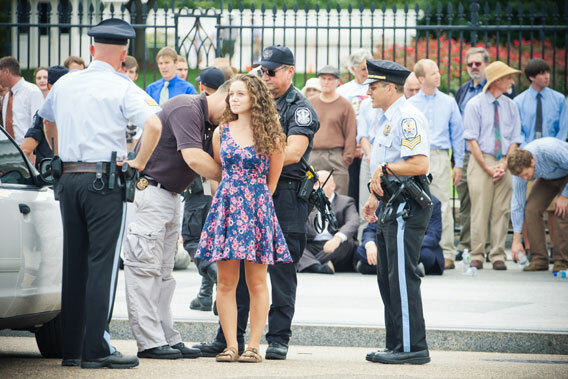 In this photo: a young woman is placed in handcuffs and arrested for civil disobedience against the Keystone XL Pipeline in the U.S. In all, 1,252 people were arrested in the two week long action. Photo by: Josh Lopez/Tar Sands Action. People flex their strength, climate change accelerates, and Indonesia works to stem deforestation. Below is a review of some of the biggest environmental stories of 2011. 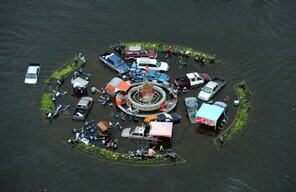 Many of 2011’s most dramatic stories on environmental issues came from people taking to the streets. With governments and corporations slow to tackle massive environmental problems, people have begun to assert themselves. Victories were seen on four continents: in Bolivia a draconian response to protestors embarrassed the government, causing them to drop plans to build a road through Tipnis, an indigenous Amazonian reserve; in Myanmar, a nation not known for bowing to public demands, large protests pushed the government to cancel a massive Chinese hydroelectric project; in Borneo a three-year struggle to stop the construction of a coal plant on the coast of the Coral Triangle ended in victory for activists; in Britain plans to privatize forests created such a public outcry that the government not only pulled back but also apologized; and in the U.S. civil disobedience and massive marches pressured the Obama Administration to delay a decision on the controversial Keystone XL pipeline, which would bring tar sands from Canada to a global market. However, expect some of these battles to rear their heads again: already the U.S. Congress is moving to force the Obama Administration to make a determination on the pipeline quickly. Despite overwhelming problems, 2011 was a year in which people proved worldwide they still have a voice. When our children look back on this decade they will likely seek to answer only one question: what was done to stem rising temperatures on Earth? Many of the world’s scientists and experts are pointing to the next ten years as a make-or-break moment on global climate change. A recent study found that if world governments are to have any chance (66 percent probability) of keeping their pledge to hold the rise global temperatures below 2 degrees Celsius, emissions would need to peak by the end of the decade and drop swiftly thereafter. But a two-in-three chance is no guarantee. For a 90 percent chance, we would need to cut total emissions before the end of the decade. Meanwhile, the International Energy Association, not known for alarmism, agrees, arguing that emissions must begin declining in just five years. Yet despite decades of increasingly dire warnings—not to mention an uptick in devastating extreme weather like droughts and floods—many scientists say governments are moving much too slowly and timidly. Last year saw greenhouse gas emissions worldwide hit a new record, jumping 6 percent from the previous year. Meanwhile greenhouse gases are taking up record space in the atmosphere with carbon now at 389 parts per million. Still, the climate war isn’t lost yet. What’s needed? Rapid deployment of renewable energy, drastic improvements in efficiency, early retirement of fossil fuel plants unless carbon capture proves rapidly viable, and a global halt on deforestation and peatland destruction. Recent research has shown that solar and wind alone could provide 90 percent of the world’s energy needs, with cars and planes running on alternate fuels. How about politically? Cutting all fossil fuel subsidies, tough cap-and-trade programs, and an ambitious international climate agreement wouldn’t hurt. It cannot be forgotten: our children will view us as either the greatest generation or the vilest depending on the outcome. 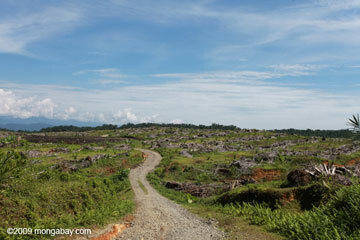 Once rainforest, now palm oil plantation: this monoculture plantation lies near Gunung Leuser National Park in Sumatra. Indonesia this year implemented a moratorium on new logging and plantation concessions with mixed results. Photo by: Rhett A. Butler. Indonesia finally passed its much heralded moratorium on new logging and plantation concessions on peatlands and in primary forests areas, but the moratorium was much weaker than expected, reflecting the influence of business-as-usual interests in the forestry sector on the Indonesian government (business-as-usual interests also stepped up pressure on green groups). The moratorium had substantial loopholes, including exclusions for industrial agriculture and mining. But the passage of the moratorium at all, reflected Indonesian President Susilo Bambang Yudhoyono’s seemingly intensified commitment to reducing deforestation. President SBY touted his 7/26 initiative, which targets 7 percent annual economic growth and a 26 percent reduction in greenhouse gas emissions by 2020 relative to business-as-usual. Reducing deforestation and peatlands degradation is the centerpiece of his push toward low carbon development. Meanwhile one major palm oil producer broke ranks and took a bold step forward: Golden Agri Resources (GAR), which had been the target of an intense Greenpeace campaign, announced one of the most progressive forest policies in the palm oil sector, committing not to develop lands with carbon stocks greater than 35 tons per hectares and promising to seek “free, prior informed consent” in engaging with communities. Environmentalists hoped other forestry companies would follow GAR’s lead. Moreover, the Indonesian government said it would ‘recognize, respect and protect’ the rights of traditional forest users, including indigenous people, a move civil society believes is key to reducing deforestation. And finally environmental groups stepped up pressure on pulp and paper companies linked to large-scale destruction of rainforests and peatlands in Sumatra. On March 11th, tragedy struck Japan in the form of a practically unprecedented (in recent human history) 9.0 earthquake and tsunami. Over 15,000 perished while entire cities were decimated by the worst earthquake in Japan’s history. But the immediate disaster wasn’t the only problem. The earthquake also lead to a meltdown at Fukushima nuclear power plant, which has become the most severe nuclear disaster since Chernobyl. Today, some 90,000 people are displaced by the meltdown with entire Japanese cities standing empty. Experts have predicted that hundreds may die of cancer linked to radiation exposure. The disaster has had global implications, as well, pushing many nations to re-consider nuclear power with Germany being the most notable example. Some warn the disaster could worsen climate change, if nuclear power is phased out for fossil fuels instead of renewables. Others argue that dropping nuclear for renewables could bring about a green energy revolution. Since, the disaster Japan has pledged to speed up deployment of renewable energy as it works to lessen its reliance on nuclear energy. 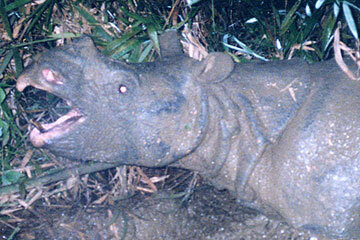 Close up of Vietnamese rhino captured on camera trap before the last individual perished to poachers. Photo courtesy of WWF. This year confirmed the extinction of two rhinos: the Vietnamese rhinoceros (Rhinoceros sondaicus annamiticus) and the western black rhinoceros (Diceros bicornis longipes). The last Vietnamese rhinoceros, a subspecies of the Javan rhino, was killed by poachers in 2009, while the last western black rhinos, a subspecies of the black rhino, were killed off in Cameroon. In addition to these tragic losses, South Africa, which is the current epicenter for rhino poaching, hit a new record this year for the number of rhinos killed by poachers: by the end of the yearly it’s likely that around 460 rhinos will have been killed, a nearly 50 percent rise in rhino killing from the previous record set last year. The IUCN Red List categorizes three of the five species of rhino—the black, the Javan, and the Sumatran—as Critically Endangered. Rhinos are being decimated by violent and organized criminals for the black market medicine trade, although numerous studies have shown no medicinal value in rhino horn beyond the placebo effect. Brazil announced forest loss during the 2010-2011 deforestation year fell to the lowest level since annual record keeping began in 1988, a continuation of a three-year trend. But enthusiasm for the news was tempered by other developments that could increase risks to the Amazon. In December the Senate voted to revise the country’s long-standing Forest Code, a move environmentalists fear could spark deforestation. The existing Forest Code, which is largely dysfunctional due to lack of consistent enforcement, requires landowners to main 80 percent forest cover on their properties. The new code, which will face a final vote in February or March before going to President Dilma Rousseff for approval, would maintain the headline 80 percent figure in the Amazon, but grant amnesty for illegal deforestation through July 2008 on properties up to 400 hectares (1000 acres) (some greens fear worry the deadline may shift in the future). The new Forest Code would also suspend fines — which fund law enforcement — and relax restrictions on forest clearing along rivers and on mountaintops. Another major development in 2011 was the decision to move forward on Belo Monte dam, a project that would block most of the mighty Xingu river, flooding more than 40,000 hectares of rainforest and displacing thousands of indigenous people. Most disturbing about Belo Monte is the precedents it sets for future large-scale infrastructure projects in the Amazon. For example a federal judge ruled in November that affected communities do not have the right to free, prior and informed consultation on the project. Meanwhile Brazilian companies continued to invest in projects that would drive large-scale deforestation in other Amazon countries, including dams, energy exploration, industrial agricultural developments, and new roads, suggesting that even though deforestation has been ebbing in recent years, there may be leakage to surrounding countries. News of infrastructure investment and development came at the same time as a series of high profile assassination of anti-illegal-logging activists in the Amazon by ranchers and loggers. Finally there were signs some private sector actors continued to be motivated by the stigma of deforestation in their supply chains. JBS-Friboi, the world’s largest meat processor, announced it would stop buying beef from ranches associated with slave labor and illegal deforestation in the Brazilian Amazon, while several banks were sued for failing to follow lending safeguards designed to prevent public finance from being used to subsidize deforestation. A punishing drought in East Africa, likely exacerbated by climate change, threatened over 13 million people this year. The crisis proved worst in Somalia, fueled by the nation’s failed government and the militant group al-Shabab. At its height, the UN declared famine in five areas of Somalia; starvation pushed hundreds of thousands of refugees into nearby Kenya, and led to the deaths of an estimated 30,000 children under five. It was the first famine declared by the UN since Ethiopia’s in 1984. Rains had failed in 2010 and were erratic in 2011 in the region, leading up to the crisis. Drought is a regular occurrence in East Africa and communities have long-adapted to dry conditions, however some experts say recent droughts are worsening due to climate change. Unfortunately climate models regarding rainfall in the region have told two different stories: some models have predicted more rainfall in the region, while others have less. However, even if East Africa will see more rainfall instead of less, it’s likely to come in bigger bursts—i.e. flooding—instead of the dependable rain needed for communities. Even as rain has come to the Horn of Africa, food scarcity continues in other parts of vulnerable continent: the UN recently warned that a food crisis could occur in South Sudan and Niger going into 2012. 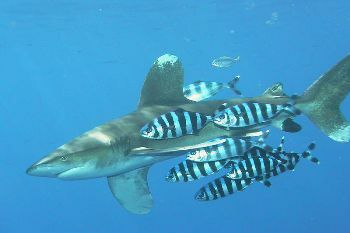 The oceanic whitetip shark (Carcharhinus longimanus) is listed as Vulnerable by the IUCN Red List. The species has dropped by over 90 percent in the Gulf of Mexico. Photo by: Peter Koelbl. In terms of wildlife conservation, 2011 was the year of the shark. Decimated by overfishing, by-catch, and shark finning, some shark populations have dropped by over 90 percent and, according to the IUCN Red List, nearly one-in-three sharks and rays are currently threatened with extinction. Yet this year may mark a turning of the tide for sharks. The end of 2010 began the good news: with the U.S. Senate passing legislation to ban shark fishing in all its waters. Shark finning, which is done solely for shark-fin soup, has led to the death of up to 73 million sharks a year according to one estimate. Meanwhile shark sanctuaries (no shark fishing allowed) have been cropping up all over the place: Palau created the first in 2009, while the Maldives and Raja Ampat Islands of Indonesia followed suit in 2010. Then in 2011 sharks sanctuaries came fast and furious: Honduras became the first nation in the Americas to create a shark sanctuary, followed soon after by Chile and the Bahamas; then Tokelau in the Pacific declared a sanctuary in its waters; finally the Marshall islands created the world’s largest sanctuary, spanning a total area larger than the country of Mexico. Progress wasn’t only made in sanctuaries. In 2010 Hawaii banned shark-fin soup, and at the end of 2011 California did the same. What’s next for sharks? Taiwan has announced Asia’s first ban on shark-finning in its waters beginning next year. Another year means another pummeling from extreme weather, increasingly linked to climate change. Last year saw the Russian heatwave, drought in the Amazon, and record floods in South America and Pakistan to name a few. This year, the U.S. suffered a record number of extreme weather events that cost over $1 billion each: twelve. One of the most notable is a drought in Texas that rivals any before 1789. Thailand experienced its worst natural disaster in history in the form of unprecedented monsoon flooding. However a tropical cyclone striking the Philippines brought the largest death toll of any storm this year: over 1,000 people. Failed rains in the Horn of Africa threatened 13 million people with food scarcity and pushed unstable Somalia into famine, <killing tens of thousands of people. Drought also hit China while flooding occurred in parts of Central and South America, and Asia. Meanwhile a report from the Intergovernmental Panel on Climate Change (IPCC) found that it was likely (66 percent) that climate change was already contributing to worsening extreme weather. As the world continues to warm, scientists predict such extreme weather will only become more frequent and nastier. 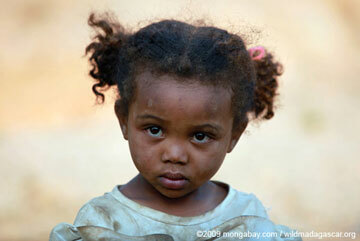 Young girl in Madagascar where 70 percent of children suffer from malnutrition. With booming population growth, 45 percent of Malagasy are under 14. Photo by: Rhett A. Butler. Sometime in the late, 1960s when the baby boomers were just coming into their own, an astounding 3.5 billion people graced the planet. This record was the culmination of millions of years of human expansion over almost every environment on Earth. Just over 40 years later—with baby boomers on the verge of retirement—and the global human population has doubled. According to the UN, this year marked the first time seven billion hearts have beat on Earth all at once. The impact is unmistakable as cities swell, forests fall, and the blinking lights of humanity are captured each night by satellite. What does seven billion mean? It means feeding, clothing, housing, and educating twice as many people as before 1970. It means tackling climate change, mass extinction, deforestation, and poverty in a world where the human population continues to grow. It means raising more food on the same land, making freshwater stretch further, and watching wilderness continue to decline. It means added pressure on every ecosystem on Earth from the abyssal ocean, to the most remote Amazon stand, to the glaciers of Greenland. Seven billion requires the need for creative, innovative, at times, wild solutions to global problems. Of course, one could also address overpopulation head-on: proven methods include empowering women, better education, universal access to contraceptives and family planning, reducing poverty, and mitigating child mortality—with all of these non-draconian, non-compulsory methods bringing additional benefits to the community and the world. For the optimists the agreement made at the 17th UN Framework Convention on Climate Change (UNFCCC) in Durban South Africa was surprisingly good: the Kyoto Protocol lives on; for the first time, 100 percent of the world’s emissions will come under a later agreement in 2020; attendants created a process to address current emissions gap; and the conference saw final approval of the Green Fund to bring billions of dollars in climate aid to the developing world. For the pessimists Durban was another in a long string of disappointing international action on climate change: a new agreement won’t be signed until 2015 and not implemented until 2020; there will be no obligatory cuts by most nations for another 9 years, only pledges; the Green Fund lacks a revenue source, meaning it’s an idea without funding; and the REDD program meant to save forests saw little progress. As for the science of climate change, researchers say emissions must peak this decade and fall rapidly thereafter if the world is to have any real shot of sticking to its pledge of keeping temperatures from rising above 2 degrees Celsius. The conclusion? If nations keep to past pledges while significantly upping their ambition in emissions cuts, if money starts to flow to the developing world and forest-nations, and if the new 2020 agreement is not only hugely ambitious, but actually has some teeth, this may possible. 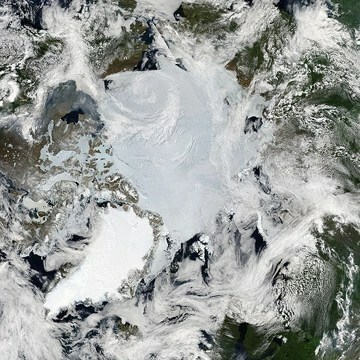 The Arctic as viewed by NASA’s MODIS Satellite in June 2010. Photo by: NASA. Climate change, caused by the burning of fossil fuels, is melting sea ice in Arctic, irrevocably changing the fragile environment. So it may seem a bit ironic that the loss of ice is leading to a sudden push to drill more fossil fuels in the very place where they are having the gravest impact, but that’s exactly what’s happening in the Arctic depths. In the U.S. the Obama Administration has granted sweeping approval to a wide swathe of drilling sites in its Arctic waters, despite widespread condemnation from environmentalists and northern indigenous communities. Many of whom warn this is simply setting the stage for an Arctic Deepwater disaster. Russia and Norway are carving up the Barents Sea for exploitation. This rush to drill has not gone unprotested: Greenpeace led a brazen civil disobedience campaign in frigid Baffin Bay this year against Scottish energy company Cairn during exploratory drilling in the deep sea. Greenpeace was able to shut down Cairn’s operations for a couple days, and Greenpeace head, Kumi Naidoo, was arrested trying to board the Cairn oil rig to deliver a protest letter. Aside from more fossil fuels to burn, critics of Arctic drilling say any spill would be practically impossible to clean given the harsh conditions and complete lack-of-infrastructure; oil companies would face freezing temperatures, moving ice, fierce storms, in addition to the fact that any spill would likely have to be abandoned during the long dark Arctic winter. While Greenpeace couldn’t defeat Cairn in its efforts, the Arctic did: the oil company has spent over $600 million drilling wells only to find nothing. Despite confusion and mixed signals, the Tanzanian government still plans to build a hugely controversial road through Serengeti National Park. In June the Tanzanian Ministry of Natural Resources and Tourism released a statement that the road “would not dissect the Serengeti National Park,” bringing relief and joy to opponents of the road around the world. However, by July it became clear that the Tanzanian government was still planning on building a road, but the path through the park would be gravel, not tarmac. However, observers have always argued that it’s just a matter of time before any road would be upgraded and widened, becoming a commercial route from the sea to the interior. Scientists believe the road will eventually cripple the world’s largest big animal migration—two million wildebeest, zebra, and Thomson’s gazelle pass along this route in annual migration from Tanzania to Kenya—and devastate regional tourism. Tanzania has stated the road is needed to help connect poor communities. However, the German government has offered to build community roads, and critics contend the road’s real purpose is to provide a short path to bring minerals out of Africa’s interior. Concerned NGOs and governments have been pressuring Tanzania to re-consider a southern route that would bypass Serengeti National Park altogether, while others have suggested elevating the road so the migration may pass beneath. By Dean KuipersJanuary 5, 2012, 12:25 p.m. 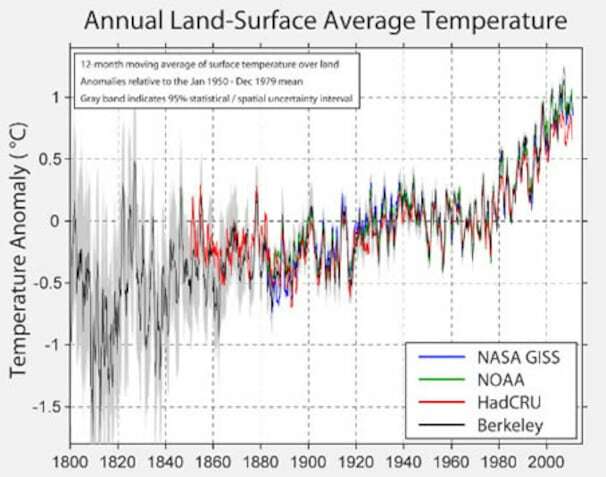 The 2011 “Climate B.S. of the Year Award” goes to the entire field of candidates currently stumping in New Hampshire for the Republican Party presidential nomination, the Pacific Institute announced Thursday. In this case, “B.S.” stands for bad science, according to hydroclimatologist Peter Gleick, president of the Pacific Institute and a member of the U.S. National Academy of Sciences. Runners-up for the award include Fox News and its parent company, Rupert Murdoch’s News Corp.; controversial climate scientists Roy Spencer and William Braswell, and fossil-fuel billionaires Charles and David Koch for funding studies by climate-change deniers and election campaigns by politicians share their views. After having become aware of the situation, and studying the various pro and contra arguments, I agree with the critics of the paper. Therefore, I would like to take the responsibility for this editorial decision and, as a result, step down as editor-in-chief of the journal Remote Sensing. … With this step I would also like to personally protest against how the authors and like-minded climate sceptics have much exaggerated the paper’s conclusions in public statements. Winners of the award get … nothing. The nonprofit Pacific Institute’s stated aim is finding scientific and policy solutions to problems including water shortages, habitat destruction, global warming and environmental injustice. CUBA’S iconic revolutionary Fidel Castro warns the world is on an “inexorable” march into the abyss this year because of climate change and the threat of nuclear war. In an article published yesterday – Castro’s first since November 2011 – the 85-year-old retired leader also took aim at the United States and at gas shale “fracking,” a new source of fossil fuels condemned by environmentalists. He did not, however, address rumors of his death, which were denied by an official Cuban blogger after they surfaced on Twitter earlier this week. “Many dangers threaten us, but two of them, nuclear war and climate change, are decisive and are drifting further away from a solution,” he wrote in an article entitled The March Towards the Abyss. Since handing over power to his 80-year-old brother Raul in 2006 because of health concerns, the leader of the 1959 revolution has rarely appeared in public but has penned regular editorials on world events. In his latest article, Fidel blamed the “inexorable” decline in part on “demagogic talk, statements and speeches from the tyranny imposed on the world by the United States and its powerful and unconditional allies”. He also wrote about the risk of nuclear war, particularly in the Middle East, where he accused Israel – the region’s sole if undeclared nuclear-armed state — of having “hundreds” of nuclear weapons. On the subject of climate change, Castro expressed fears about hydraulic fracturing – or “fracking” – a process by which water, sand and chemicals are blasted into the ground to release oil and gas trapped in solid rock. The process has been hailed by oil companies and other backers as a key new source of fossil fuels, but critics have expressed fears about its impact on the environment, health and safety. Rumors of Castro’s death have surfaced periodically since his retirement, most recently on the micro-blogging website Twitter earlier this week. But official Cuban blogger Yohandry Bloquera, who is usually well-informed and reliable regarding events in Cuba, denied the reports, saying Castro was reading them himself and “laughing” at them. In a year marked by a relentless assault of extreme weather, several events stand out. Some, like the tornado that leveled Joplin, Missouri on May 22. were extraordinarily devastating and deadly. Others – such as the “Snowtober” storm that buried the Northeast under a crushing load of heavy, wet snow – were downright freakish. In a typical weather year, one might expect a few extreme events like these. But this was no ordinary year. At times it seemed as if Mother Nature was on steroids, slamming Americans with one deadly event after another (a good case can be made that Mother Nature is, in fact, on steroids, thanks to global warming). Consider this: according to NOAA, there were at least 12 events that cost a billion dollars or more, an all-time record (there were 14 such events by other measures). More than 1,000 people died from weather-related causes this year, most of them from tornadoes, and more than 8,000 people were injured, according to the National Weather Service. As we’ve covered on this blog, scientific research shows that global warming is likely increasing the odds and severity of certain extreme events, such as heat waves and heavy precipitation events. These aren’t exactly comforting findings, given what transpired this year. Here are the top 5 extreme weather events of 2011. 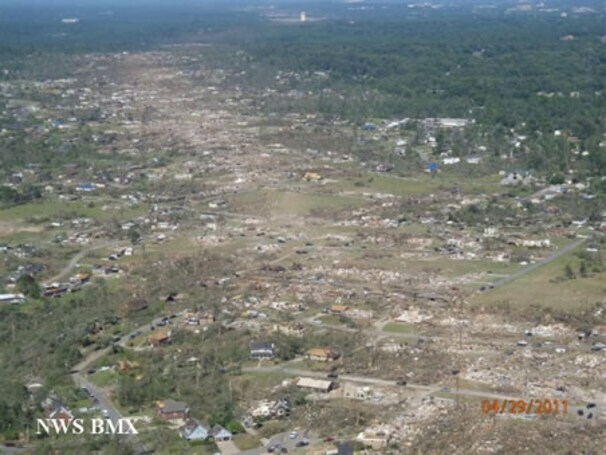 Aerial view of damage from April 27, Tuscaloosa tornado (NOAA) 1. The April 25-28 Tornado Outbreak. This was the year of the twister, and multiple tornado outbreaks exacted a heavy price in terms of lives lost. The death toll from many of this year’s tornadoes were so high (tied for second highest on record) that the National Weather Service has embarked on a broad-scale effort to reexamine how it educates the public about tornado risks, and how tornado warnings are worded and disseminated. The deadliest of this year’s outbreaks occurred in late April. During a four-day period from April 25 to 28, more than 200 tornadoes touched down in five southeastern states. The deadliest day was April 27th, when 316 people died – mainly in Alabama and Mississippi – from 122 tornadoes. On that day, major tornadoes tore through the cities of Tuscaloosa and Birmingham, and all-but wiped out many rural communities. The Tuscaloosa-Birmingham EF-4 tornado was on the ground for more than 80 miles, and seven other tornadoes stayed on the ground for at least 50 miles. April 2011 now ranks as the most active tornado month on record with 753 tornadoes, beating the previous record of 542 tornadoes set in May 2003. NOAA has put the total number of April tornado-related fatalities at 364. 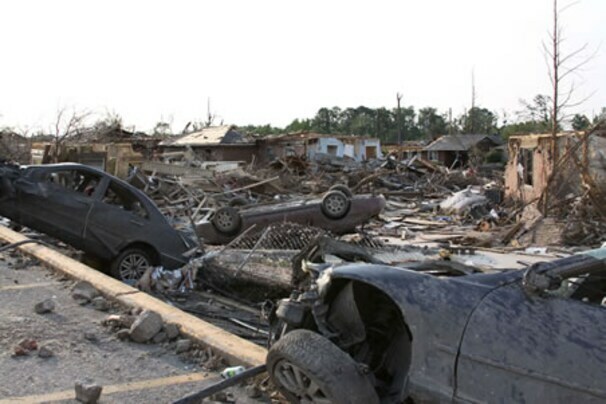 The most intense tornadoes flattened some communities. Here’s what a Weather Service storm damage assessment team found in the small town of Phil Campbell, Alabama, after a tornado tore through there on April 27th. Along Bonner Street, multiple block homes were leveled to the ground with the block foundations destroyed. A twenty-five foot section of pavement was sucked up and scattered. Chunks of the pavement were found in a home over 1/3 of a mile down the road. The damage in this area was consistent with EF-5 damage. Radar image of thunderstorm that spawned the catastrophic May 22 Joplin tornado. The bright pink area, or “debris ball” shows where the radar was sensing debris from the tornado.On May 22, the small city of Joplin, Missouri joined the list of cities whose names are synonymous with tornado disasters and recovery efforts, when an EF-5 tornado swept through the heart of the city, destroying nearly everything in its path. The Joplin tornado killed 160 people and injured about 1,000 more, becoming the seventh-deadliest tornado in U.S. history, and the deadliest since modern recordkeeping began in 1950. 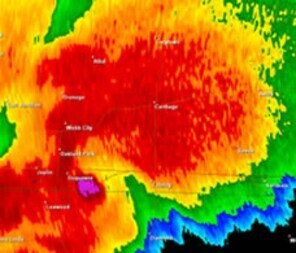 The Joplin tornado had maximum winds estimated at 210 mph, reached a width of at least a mile wide, and remained on the ground for six miles – just long enough to devastate the city. The tornado was part of a larger, multi-day outbreak during which 180 tornadoes touched down in the central and southern states, resulting in more than $9.1 billion in total losses, according to NOAA. One of the costliest natural disasters of the year evolved over a longer timespan and across broader geographic region, as drought conditions parched the Texas landscape and portions of Oklahoma, New Mexico, Arizona, Kansas and Louisiana. In Texas, the drought was the most intense one-year drought on record, with direct losses to crops, livestock and timber of close to $10 billion. The drought was aggravated by record heat, with many locations across the Southern Plains setting records for the most 100-degree days, including San Angelo, Texas, which reached the century mark on 98 days this year. Oklahoma had the hottest summer of any state in American history, just edging out Texas, which came in second. Oklahoma’s average July temperature was 88.9 degrees, making it the warmest month in any state on record. The dry conditions forced ranchers to send their cattle to the slaughterhouse early. According to recent reports, 2011 saw the largest-ever one-year decrease in the number of Texas cattle, a loss of about 600,000 cattle in just one year. This may translate to higher beef prices in 2012, due to a below average supply. The drought and heat also set the stage for the worst wildfires in Texas state history, including the Bastrop fire, which was the state’s most destructive wildfire on record. Wildfires also charred vast stretches of Arizona, New Mexico and Oklahoma. In fact, Arizona and New Mexico both saw their largest wildfires on record. At one point, the Las Conchas Fire in New Mexico, which burned over 150,000 acres, threatened the Los Alamos National Laboratory, the birthplace of the atomic bomb. Irene making landfall in New York City on August 28, 2011. (NOAA) Hurricane Irene, which made landfall in North Carolina as a Category One storm on August 27, will be remembered mainly for two things:one being the devastating inland flooding the storm caused from New Jersey to Vermont. The second concerns what it (fortunately) did not do – cause significant coastal flooding in the New York City area. Nevertheless, Irene managed to grind life to a halt in the city that never sleeps – with the first ever shutdown of mass transit, including all three airports, and mandatory evacuations of people from vulnerable parts of the city. Because the storm was weaker than expected when it struck the city – as a tropical storm rather than a hurricane – the damage was far less than feared. However, as Jeff Masters has detailed at Weather Underground, the lack of damage in New York City should not be taken as a sign that the city is safe from such storms. Irene reserved her worst for a sneak attack on inland areas. 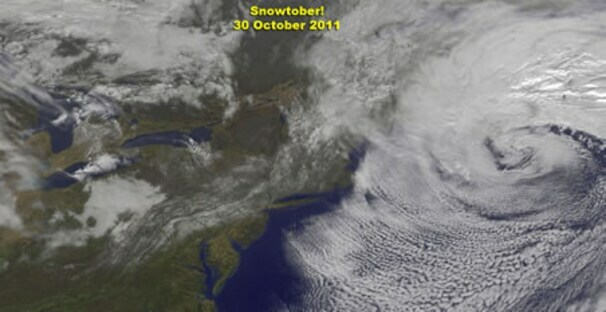 After an extremely wet summer, Irene’s rains caused record flooding in New Jersey, New York and Vermont. Many of Vermont’s iconic covered bridges were washed away, and entire communities became cut off from transportation routes. The storm also caused massive power outages, with upwards of seven million homes and businesses without power at the height of the storm, according to NOAA. Related links: Was Irene overhyped? To put the storm into its proper meteorological context, consider these snowy facts. The storm brought thundersnow to New York City shortly past lunchtime on Saturday, October 29, before the city had even recorded its first freeze. Central Park received 2.9 inches of snow, with up to six inches falling in the Bronx. This was the only time in recorded history that an inch or more of snow has fallen in Central Park during the month of October. Jaffrey, New Hampshire, recorded 31.4 inches of snow, and 32 inches fell in Peru, Mass. In Concord, N.H., 22.5 inches fell in just 16 hours. October snowfall records were smashed in Hartford, Connecticut, which received 12.3 inches; Worcester, Mass., where 14.6 inches fell; and Newark, NJ, where 5.2 inches piled up. The timing of this storm made it a high impact event, although it would have been noteworthy for its intensity and heavy snowfall even if it had occurred in February. 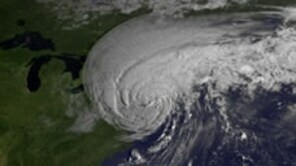 For Earth’s climate system, 2011 was an extraordinarily turbulent year. The United States saw a series of record-busting extremes, from a devastating tornado season to an epic drought in a vital agricultural region. The fusillade of extreme events kept global warming in the public conversation even as it slipped to the bottom of the public’s list of concerns in the face of a grim economy, and as “climate” became a four-letter word in Washington. Two studies published in February in the journal Nature made it a lot clearer that manmade global warming is already playing a tangible role in influencing some types of extreme weather events. One study, led by researchers with Environment Canada, analyzed heavy rainfall events recorded at more than 6,000 sites across the Northern Hemisphere, and found that the growing amount of heat-trapping gases in the atmosphere have likely increased the frequency of heavy precipitation events across this region. The second study demonstrated a new way of analyzing how manmade global warming may have increased the chances for a particular flood that occurred in the U.K. in 2000. The high-resolution computer model used for the study showed that global warming increased the risk of the 2000 flood event by at least 20 percent, with two-thirds of the computer model simulations showing a much larger increase in flood risk, by up to 90 percent. As I detailed in September, climate scientists are moving forward with plans to form an international extreme events attribution group, which will focus on advancing this type of work. The report by the United Nations Intergovermental Panel on Climate Change makes clear that warm weather extremes and heavy precipitation events have increased, most likely as a result of manmade climate change. And it projects with a high degree of confidence increasing hot weather and heavy downpours in the future. For years, global warming skeptics sought to cast doubt on the surface temperature record. Some said warming was an artifact of the urban heat island effect – which can raise temperatures in urban areas compared to rural locations – rather than increasing concentrations of greenhouse gases. Others pointed to inconsistencies in correcting for gaps or biases in the data. A web-based movement formed, with a small army of volunteers documenting the locations and setup of official weather stations. In response to numerous questions about the surface temperature record, a blue-ribbon panel was organized to find out once and for all if the Earth is really warming, and by how much. The panel was led by physicist Richard Muller of the University of California-Berkeley, who had expressed skepticism about mainstream climate science findings in the past, and some of the money for the panel came from politically conservative-leaning groups. In the end, though, the Berkeley Earth Study, confirmed what most climate scientists already knew – the surface temperature data is correct in showing a pronounced warming trend. To be specific, the analysis found there has been 0.911 degrees Celsius of land warming (+/- 0.042 C) since the 1950s, or about 1.8 degrees Fahrenheit. The Berkeley team’s analysis strongly refutes claims that the urban heat island effect causes a warm temperature bias in the surface data. The researchers also found that despite the skeptics’ assertions, readings from networks of temperature stations are not compromised by poor data quality from many of the individual stations. For the thousands of experts who study the climate, 2011 was something of a rebuilding year – a chance to regroup from the turbulence caused by the so-called “climategate” emails scandal. After multiple investigations cleared climate scientists of the most serious allegations of wrongdoing, more emails between a few top climate researchers were released, again purporting to show climate scientists doctoring scientific evidence and conspiring to keep out dissenting voices from peer-reviewed journals. This time, however, the damage to climate science’s street cred was minimal, as the media and the scientific community quickly found the emails to lack much evidence of anything scientifically significant. The unauthorized release of the new batch of emails may have jump-started what seemed to be a dormant investigation into who obtained the emails and posted them on several websites, with actions by law enforcement agencies in the U.S. and Britain. The 2010 midterm elections brought into power a surge of House lawmakers who either strongly questioned or flat out denied the existence of manmade climate change. As a result, the gap between climate scientists and politicians became wide enough to swallow what were once thought of as common sense, bipartisan ideas – such as creating a National Climate Service within the National Oceanic and Atmospheric Administration (NOAA) to complement the National Weather Service. Under the proposal, which was originally put forward by the Bush administration, the Climate Service would serve as a one-stop shop for climate info, from El Nino forecasts to projections of what the climate may be like 50 years from now. The proposal called for realigning NOAA’s offices and functions to meet the increasing demand for climate information from farmers, businesses, investors and others who currently must navigate an alphabet soup of NOAA organizations to find the information they’re looking for, and to develop new climate analysis products and tools. NOAA requested no new money for the move, instead seeking congressional approval to restructure itself. House Republicans blocked the move, and even sought to investigate whether NOAA was moving forward with the plan against its wishes. (For more background info, see this Post story by Brian Vastag). The death of the Climate Service proposal was presaged by a vote last spring that put House members on record about whether they agree with the scientific evidence showing that the globe is warming, likely due in part to human activities. The fact that it failed by a vote of 184 to 240 (three Democrats were among those who rejected the amendment; one Republican supported it) signals the depth of the problem that scientists, environmental policy advocates, environmentalists, and others face in pushing for climate change action at the federal level. A majority of one chamber of the Congress just does not agree with the conclusions of most publishing climate scientists. This is a remarkable turn of events, considering that the last Congress narrowly passed a sweeping greenhouse gas regulation bill, which died in the Senate. Scotland’s First Minister Alex Salmond has urged world leaders to make 2012 a ‘year of climate justice’ ahead of a major United Nations conference on sustainable development in June. The Government leader said climate justice should be the focus of sustainable development during 2012 and form a major part of discussions at the Rio+20 to be held in Rio de Janeiro in Brazil. And he explained how climate justice would link human rights and development, put people at the heart of our economic system, and allow all to share the burdens of climate change and benefit from its resolution. The call comes after the First Minister raised the issue of climate justice during a speech to the influential Communist Central Party School in Beijing during his recent trip to China. Climate justice was also raised by Mr Salmond and Mary Robinson, former President of Ireland and former UN High Commissioner for Human Rights, in a joint communiqué to the UNFCCC meeting in Durban, South Africa, last month. Mr Salmond said: “It is vitally important that, as the world moves towards economic recovery in 2012, we place climate justice at the very heart of the decisions we make on energy policy and economic and social development in the coming months. “In the run up to the UN Rio+20 conference in Brazil in June and beyond, I am calling for climate justice to be made central to decisions taken by major countries on energy and development. “It is also my sincere hope, given the fact one of the themes of this year’s conference is the green economy linked to sustainable development, that climate justice forms an important part of Scotland’s contribution to Rio+20. KOMPAS.com — Enam kota mendapatkan pengakuan sebagai kota dengan kebijakan terbaik untuk pelaksanaan green building, serta pengurangan emisi karbon dari bangunan dengan konsep green. Keenam kota itu ditetapkan dalam Konferensi Perubahan Iklim Perserikatan Bangsa-Bangsa di Durban, Afrika Selatan, 5 Desember 2011. Gerakan menuju kesadaran tinggi terhadap green building di kota-kota besar dunia memang terus digalakkan oleh World Green Building Council (WorldGBC). “Bangunan bisa menghadirkan potensi berbeda dalam fungsinya mengurangi efek rumah kaca. Untuk itu, kebijakan pemerintah dalam mengelola kebijakan bangunan yang ramah lingkungan punya peran penting untuk menggarap potensi ini,” ujar Jane Henley, CEO dari WorldGBC, beberapa waktu lalu. Kota-kota yang memenangi penghargaan ini, lanjut Jane, telah berhasil mengimplementasikan prioritas pada reduksi emisi, dan mendapatkan manfaat penghematan, serta menghasilkan energi jauh lebih aman. “Kesehatan dan tingkat hunian yang cukup pun bisa tercapai sehingga bisa membantu pertumbuhan perekonomian. Kami sangat bangga untuk mempersembahkan penghargaan inovatif ini kepada kota-kota tersebut,” ujarnya. – San Fransisco, Amerika Serikat, khususnya untuk San Fransisco Green Building Ordinance berhasil mendapatkan Best Green Building Policy. Penghargaan ini mencakup kebijakan pembangunan ramah lingkungan untuk bangunan komersial, residensial, dan pembangunan konstruksi, sesuai dengan LEED green building standards (standar “green” untuk Amerika Serikat). Dampaknya, 105.000 ton karbon dan keuntungan sebesar 1 miliar dollar AS untuk estimasi 10 tahun bisa diraih. Kota ini juga memiliki skema pembiayaan finansial untuk menggapai target proyek individual. – Mexico City, Meksiko, meraih Climate Action Leadership Award, untuk program Climate Action Plan-nya. Program ini berhasil mengurangi emisi dari bangunan komersial dan residensial secara lokal. Meksiko City sendiri telah setuju untuk mengurangi emisi CO2 sebesar 7 juta ton hingga 2012 ini. – Birmingham, Inggris, untuk Birmingham City Council’s Energy Savers Program, yang mendapatkan Urban Retrofit Award. Program ini berusaha untuk mencapai 1,5 miliar poundsterling keuntungan dari green retrofit, untuk pekerjaan pembangunan 200.000 bangunan di Birmingham hingga West Midlands. Pembangunan ini direncanakan hingga 15 tahun mendatang. – Singapura, yang berhak mendapatkan Regional Leadership Award untuk Green Building Masterplan-nya. Sebuah rencana ambisius yang akan “menghijaukan” 80 persen bangunan di Singapura hingga tahun 2030. Bangunan ini akan diproyeksikan mencapai standar Green Mark Building Certification, suatu standar “green” untuk bangunan di Singapura. Proyek ini diharapkan bisa menghasilkan penghematan 780 juta dollar AS setiap tahunnya. – New York City, Amerika Serikat, yang meraih Industry Transformation Awards untuk Greener, Greater Bussiness Plan-nya. Ini adalah bagian dari kebijakan pemerintah New York yang mensyaratkan setiap bangunan harus menyampaikan secara publik penggunaan energinya tiap tahun. Program ini diharapkan bisa mengurangi emisi karbon di New York hingga 5,3 persen dibanding tahun 2009. Program ini juga berhasil menghemat energi hingga 700 juta dollar AS per tahun hingga tahun 2030 dan mencakup 17.800 pekerjaan konstruksi baru di kurun 10 tahun. As we understand, the UNFCCC conference discusses issues and future actions for climate change mitigation and adaptation. This year, the 17th session of the conference has its own distinctive significance to determine the future climate regime since the first carbon reduction commitment period under the Kyoto Protocol will expire next year. Despite the importance of the conference, sending 230 people to one conference is an act beyond reasonable limits. To explain why, we first need to make a distinction of approaches between types of negotiations: political and technical negotiations. Political negotiations are conducted when countries discuss and seek to agree on certain commitments, while technical negotiations are the further talks on how to best achieve them. Dispatching 230 people as delegates is problematic because in political negotiations, the mandate of commitments can, and should, be delegated to selected departments. The participation of more technical ministries is only crucial in the later phase where there is a need to devise a more technical plan of action to meet the commitments made. This means the participation of representatives of 17 ministries in the negotiation, which is the case in Durban, is a waste of resources. Unfortunately, a clear delegation of mandate which should be assumed preferably by the Ministry of Foreign Affairs remains unavailable in our legal framework of international engagement; a crucial deficiency in our international negotiation approach. Until today, each technical department still plays a dominant role to the point that the Ministry of Foreign Affairs sometimes only assumes the role of a facilitator. At the UNFCCC, technical departments dominate the delegations. According to the UNFCCC list of participants, while many ministries sent more than 10 delegates (some even sent more than 20 people), the Indonesian Ministry of Foreign Affairs only had 6 people in their squad. Even if the conference involves some technical negotiations, to a certain degree that requires technical expertise from each department, more effective and efficient approaches are available, for instance through wireless communication, without having to field a big team. The second problem with sending so many people as delegates concerns the nature of political negotiations, where commitments are made politically between the highest authorities of countries: presidents or ministers. Because only senior officials, ministers and deputy ministers, are able to make a diplomatic and political gesture, only a few non-senior officials are required. Nonetheless, in many international conferences, including in the UNFCCC, Indonesia tends to dispatch a large number of officials below the rank of ministers or deputy ministers. The bulk of the delegation mostly serves as assistants to the high ranking officials. They take notes, prepare speeches and statements, collate supporting documents, produce reports and even to some extent prepare logistical arrangements. To point out an example, in the UNFCCC delegates, the Ministry of Environment and the National Board of Climate Change (DNPI) sent more than 20 people; clear evidence of an excessive use of personnel. Because the presence of most people there is not a necessity, the cost incurred by sending them there cannot be justified. The estimated cost for sending 230 people to South Africa, including flights, accommodations and allowances, can reach US$800,000. In a year, dozens of similar international negotiations on environmental and other issues take place. Such an amount of money will serve our environment better should it be allocated for tangible environmental protection and conservation efforts. Not only that, probably less in magnitude but still crucial in essence, the carbon print of air travel is so massive that the demands to put a special environmental tax on air travel has surfaced. Sending 230 people to Durban means, we emit tons of carbon into the atmosphere. This is clearly an act against the spirit of climate change mitigation efforts. Most importantly, with all the costs, the progress we have achieved in international mitigation and adaptation efforts in climate change this year remains minor. The clarity of the second commitment period of the Kyoto Protocol is still in doubt. The progress made in the promised Green Climate Fund, which should reach $100 billion for climate mitigation and adaptation projects per year by 2020 has not been materialized. And lastly, the future of Climate Development Mechanism and REDD+ (Reducing Emission through Deforestation and Forest Degradation) to support green projects in our industry and forestry sector is still unclear. Even if there was significant progress to be observed in Durban, it cannot justify the large number of delegates simply because it did not contribute to the course of the negotiation. Evan Oktavianus is an analyst at the Ministry of Finance of Indonesia, currently a masters’ student at the University of Oxford, UK, majoring Environmental Change and Management. Ary Adiati graduated from the Department of Communications, Faculty of Social and Political Sciences, Diponogoro University, Semarang. The UN climate change conference in Durban, South Africa, ended with an extension of the Kyoto Protocol and a commitment to put a new arrangement in place by 2015 and in force from 2020. An extra two days of negotiations were worth the effort, as finally the world agreed that both poor and rich countries should cut their greenhouse gas emissions under a global pact with “legal force.” This is a big achievement for climate negotiations. The Durban outcome was a product of compromise, especially for the world’s largest emitters, China and the United States. For some this is historic, for others disappointing. Some see the Durban agreement as still benefitting developed nations. The youth and civil society contingent at the summit loudly demanded that their leaders listen to the people rather than to polluters. Many leaders proclaimed that they had acted to save future generations. In reality, however, this is far from true. Indonesia’s delegation head, Rachmat Witoelar, said it was our moral obligation to ensure that the world did not suffer from a climate crisis. The world has to work together to achieve global solutions to address climate problems with the principle of common but differentiated responsibilities. Developed countries should take moral responsibility for the historic emissions they released as their economies grew, and because poor nations will suffer most from climate catastrophe. In climate negotiations, rich nations tend to dictate the economic growth of poor nations, which are aiming to grow their economies as developed nations have. Indonesia has been consistent with its prior statements after becoming, at the G-20 conference in Pittsburgh in 2009, the first developing country to pledge voluntary commitments to reduce emissions. In the past year, at least six policies were issued by President Susilo Bambang Yudhoyono to adjust regulations in line with national emissions reduction targets. What has Indonesia received for this? Mostly criticism from local and international NGOs, as well as its own legislature and the private sector, mainly for decisions that are considered damaging to the economy or, on the contrary, deemed insufficient to fulfill the country’s commitments. What did developed countries do? Not much but hide behind their economic and political reasons, or the global financial crisis. It is tough to find justice in the climate regime if richer countries dictate that developing countries curb their economic growth while rich countries will not change their attitudes. China, in tandem with India, insisted that richer countries act faster to curb emissions. At the same time, developing countries need to reduce poverty and raise living standards. Developing countries expect assistance, both financial and technical, from developed countries to achieve growth through low-carbon economic development. Compromise in the global climate regime is difficult to achieve, as intrigues and vested interests abound. A “fast-start fund,” promised in Copenhagen two years ago as part of a long-term Green Climate Fund financing scheme, has been slow to take shape. The distribution of a $30 billion green fund to developing countries was blocked by the United States. The US negotiator in Durban cited inadequate transparency of its governance as the reason. A global climate plan should not be about money “begged for” by developing countries, but about morality and justice for the climate. As for Indonesia, the $1 billion the country is receiving as part of a deal with Norway to reduce emissions from deforestation is nothing compared with the revenue that Indonesia could earn from forestry, mining and agriculture in forested areas. What Indonesia sacrifices is an example of following through on a moral obligation. In the global arena, Indonesia’s forests play an important role in a climate change solution. Indonesia has the opportunity to cut down its forests, to convert the land into food-producing farms to feed global demand — or to implement REDD (Reducing Emissions from Deforestation and Degradation) schemes as a way to achieve productivity without cutting down the trees. But if recent history is any guide, money doesn’t, as they say, grow on trees. The province of Aceh has had a moratorium on logging for more than four years, but has still received no REDD money to compensate for its efforts. The president has shown his leadership and courage to inform the world that Indonesians are willing to be part of global climate solutions by protecting their forests and peatlands. In September, Yudhoyono reiterated his commitment to protect Indonesia’s remaining forests during the final three years of his presidency. The Durban climate talks ended with agreements to work toward a legally enforceable deal by all countries, to go into effect by 2020, and to work toward identifying a global goal for substantially reducing global emissions by 2050. The UN secretary general, Ban Ki-moon, stated that we are running out of time. The truth is that 2015 or 2020 are already too late, and action should have started a long time ago. Agus Purnomo is special adviser to President Susilo Bambang Yudhoyono on climate change. Yani Saloh is Agus’s assistant.